Most of the time I am pretty good at making sure my cameras are set to the correct time and date. However, on a recent overseas trip I completely forgot to adjust the time in my camera to take into account the 4.5 hours time difference between Sri Lanka and the UK until the end of the first day of shooting. Normally this isn’t a problem at all. A few clicks in Lightroom and you can either adjust a series of images by a set number of hours (time zone adjustment), or set to a specific time. However, it is likely that you may have only used Lightroom to adjust the time by whole hour increments (the “Shift set number of hours (time zone adjust)” option under Metadata > Edit Capture Time…). 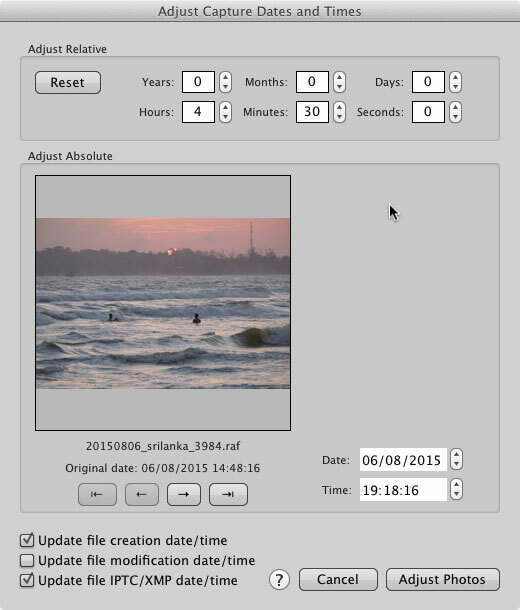 Sri Lanka is GMT +5.5 hours, and the standard “time zone adjust” option in Lightroom only shifts the capture time by whole hours. The Lightroom “Edit Capture Time” dialog, showing the whole hour increments for adjusting time zones. (By the way, Sri Lanka is one of 14 or so territories around the world running on a x.5 hour time difference from GMT. Together these territories make up approximately 1.5 billion people (mostly in India), or roughly a fifth of the world’s people. See the list at the bottom of this post if you are interested). To correct for x.5 hour time zone adjustments you need to use the first option in the dialog box – “Adjust to a specified time and date”. This does just what it says for the first photo in a selection (adjusts to a specific time), and all other photos in the selection are then adjusted by the same amount, i.e. the change to the first photo is absolute, and the rest of the selected images are adjusted relatively by the same time difference. Using the Lightroom “Edit Capture Time” dialog to adjust a selection of images by a set amount of time (+4 1/2 hours in this case). If you use Photo Mechanic to import large numbers of images then adjusting capture times is a little more obvious and clear. Select the files to be changed and then select Tools, Adjust Capture Dates and Times… from the menu. The following screen will then pop up, allowing you to make absolute or relative adjustments to the times of your files. The Photo Mechanic “Adjust Capture Dates and Times” dialog, showing how one can easily adjust the capture time for a series of images by four and a half hours. Change the time to correct amount. Note the check-box options in the lower left of the window – make sure that the Update file creation time box is checked so that the new time is written back to the image file.